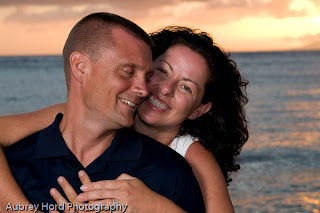 Aubrey Hord Photography: Maui Honeymoon Photographer - Gwen & Ray! I had the pleasure last week of photographing a happy newlywed couple from Waukegan, Illinois named Gwen and Ray who were not only celebrating their marriage but also visiting Maui for the first time. 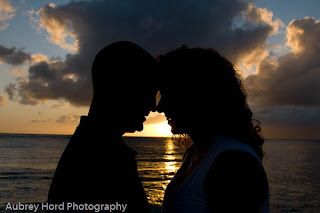 We headed to Kapalua Bay which is oftentimes idyllic for photo shoots in the morning and at sunset. It has a wonderful grove of coconut trees which serve as a scenic backdrop just above the beach. Gwen and Ray wanted some formal photos as well as some candids so we had some fun getting creative all around Kapalua Bay. shoot, having a water fight and then posing together lying down just at the water's edge. We even had the blessing of a rare visit by an endangered Hawaiian Monk Seal who was fishing for eels and playing in the bay just after sunset. Just as we finished our photo session, the seal came up onto the beach and settled under some trees in a protected cove on the beach. How amazing! Most of the time, Gwen and Ray were laughing together which made it totally fun to shoot from my perspective and entertaining for everyone! 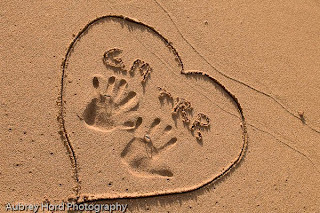 I am so glad they chose me to photograph their first few days together as husband and wife. All the best to the two of you! Congratulations to Gwen and Ray! Safe travels home and we will see you on your next visit to Maui!